The first day of the event kicked off with opening remarks by the organizing bodies. 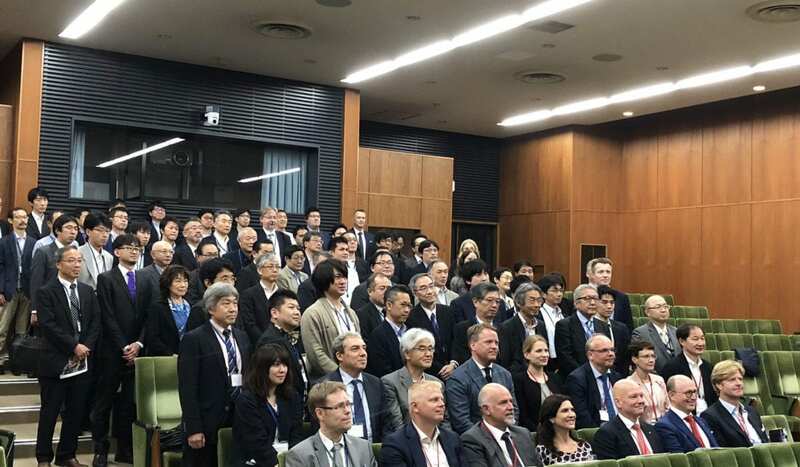 The Chair of the AEC, Mr. Tero Vauraste, underlined that by bringing the event to Sapporo, the Arctic business community wanted to show that it is interested in creating closer ties to stakeholders south of the Arctic. The AEC is not a closed club but welcomes new members from across the globe. Vice Governor of Hokkaido, Mr. Yasuhiro Tsuji, expressed his strong support to the event and encouraged the stakeholders to continue cooperation. Senator Lisa Murkowski (R-AK) also sent a message of support and expressed how happy she was to see the event that started in Barrow (Ukpeagvik), Alaska has continued to develop. Subsea Data Cables: Global Game Changer? The first panel discussion focused on (subsea) data cables. One of the factors driving the Arctic’s future is global digitalization. Without access to affordable and stable broadband, the rural parts of the Arctic will be left behind of the development brought by digitalization. Further, the Arctic has a geographic advantage: uniting 3 continents, it provides the shortest link for data cables. Led by Nao Yanagawa, President of Flower Communication, the panelists discussed the plans for improved connectivity in or through the Arctic. The planned subsea cables can become a game-changer not just for the region, but also globally. Here Hokkaido has a strategic location as a potential landing site. Mr. Johannes van de Kemenade, a member of the board of directors for NxtVn, presented the company’s vision for improved global connectivity by linking the Arctic to Central Europe. AEC’s Vice Chair Heidar Gudjonsson provided an insight into the increasing need for data and the potential it provides in the Arctic region in terms of datacenter development. Ms. Marjukka Vihavainen-Pitkänen, co-chair of the Arctic Council Task Force on Improved Connectivity in the Arctic (TFICA) provided a valuable insight to the Arctic Council’s work and proposed closer collaboration between the Arctic Council and AEC in this field. The phenomenal growth in data traffic and data centers provided the backdrop for the second panel of the event. It is estimated that in 2017, data centers alone accounted for 7% of electricity usage in the world. They are forecasted to triple in the next 3 years, making the industry by far the single biggest user of electricity. The carbon footprint which follows is growing alarmingly. Led by Heidar Gudjonsson, a panel consisting of a group of international experts from business and academia discussed whether the Arctic with its abundance of energy and cold climate could contribute to solving the increased demand for energy while simultaneously providing a less polluting means to drive the industry. The second day of the event was kicked off with presentations highlighting the innovative opportunities provided by increased collaboration between stakeholders representing multiple areas of expertise. Mr. Jaap van de Beek provided the participants with an overview of the socio-economic and technical challenges related to providing good connectivity in remote areas. The rest of the 3rd Top of the World Arctic Broadband Summit focused on Arctic maritime issues and challenges related to connectivity at Arctic Seas. Mr. Vauraste led a panel consisting of business leaders as well as representatives of the academia who shared their experiences from the Arctic. As commercial shipping activities in the Arctic are increasing, there is also an increased need for connectivity and situational awareness. Professor Natsuhiko Otsuka from the Hokkaido University provided an insight to the opportunities related to the use of the Northern Sea Route. Wrapping up the event, ambassador Harri Mäki-Reinikka from the Ministry for Foreign Affairs for Finland focused on the importance of the business community in the development of the Arctic. The AEC is grateful to the Hokkaido Government, the Hokkaido Committee for Economic Development as well as the Hokkaido University for the collaboration in organizing the 3rd Top of the World Arctic Broadband Summit.